One of our most well-loved pieces of furniture, the dresser combines the best of storage and display, with solid hardwood shelving, cupboards and drawers. 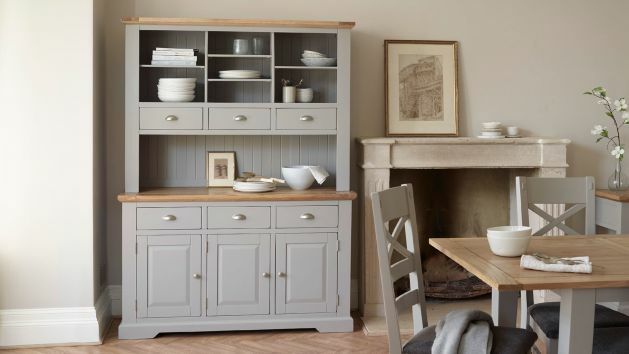 Our stunning dressers will exude farmhouse charm in your home and offer valuable storage and display areas, with solid hardwood shelving, cupboards, and drawers that are perfect for housing plates, crockery, and table linen. Dressers have always been one of the most well-loved pieces of furniture in British homes and rightfully so, as it has it all; storage, display, great style, and with us, it’s all made in a high-quality solid hardwood finish throughout. Dressers are one of the most well-loved and widely available units for storing cutlery, table linen and crockery. Available in small or large sizes, you can also choose from whether you prefer an open, glazed or part-glazed unit. Whatever dresser you may choose, it's quite important to invest in something that is as gorgeous as it is spacious. Choose from a range of sophisticated styles, whether that’s solid oak with a rustic finish, or grey or white painted hardwood dressers. And when you’ve found your perfect piece, we have loads of items that will pair well with it among our collections of painted furniture, natural wood dining room items, and living room furniture. All our dressers have been built using high-quality hardwood to ensure lasting quality. The natural grain patterns in the wood bring a rustic feel that evokes a sense of warmth and comfort – our oak pieces have a more subtle pattern, while our mango dressers boast a more dramatic grain. The cupboard doors, backs and drawers are all made using solid hardwood and the drawers are finished with screwed and glued joints for added strength and stability. Our dressers boast plenty of storage so you can finally give those heirlooms and photos scattered around the house a rightful place. Whether you want open shelves to put your favourite ornaments on display, lots of drawers to stash loose belongings or a roomy cupboard area for hiding larger items, choose from a style that best suits your space and your storage needs. We can deliver all our furniture free of charge, so you don’t have to worry about delivery costs. Your chosen dresser will also be delivered to the room you’re going to use it – all as part of the service. Don’t want to pay the full cost straight away? No problem. Our furniture financing gives you the option to stagger the payments monthly for up to four years.